Is there any limit to the degree of bend in an optical cable? In general, the minimum allowable bend radius of a cable is 10 times the outside diameter of the cable or the minimum bend radius of the fibers in the cable, whichever is larger. The minimum allowable bend radius of optical fibers is generally 30 mm. Accordingly, bending an optical cable to a bend radius of less than 30 mm should be avoided, however small the cable diameter. However, Sumitomo Electric has developed PureEther-Access and PureAccess-PB, an MM fiber and an SM fiber respectively, both of which feature a minimum allowable bend radius of 15 mm. Moreover, Sumitomo Electric has developed a 7.5 mm bend-radius SM fiber PureAccess-A2, representing a breakthrough in the optical cable bend radius. Multimode optical fibers have a core diameter of 50 µm or 62.5 µm. What differences are there between these specifications? The 62.5 µm core diameter is used commonly in the United States, while the 50 µm core diameter is generally used in Japan. The difference in core diameter entails the use of different transmission equipment. Optical fibers made to the larger 62.5 µm core diameter spec are easier to connect with transmission equipment, which implies the use of low-cost equipment. In contrast, the 50 µm core diameter spec necessitates the use of relatively costly equipment, yet with the advantage of optical fibers enabling a broader band. In recent years, the 50 µm core diameter spec has been on the way to the mainstream due to the popular use of the Gigabit Ethernet, for instance the 10-Gigabit Ethernet, incorporating broad-band optical fibers. Which optical cables offer resistance to moisture or water? Typical examples of such cables are the LAP-sheathed and WB types. The LAP-sheathed cable has the inside of the sheath lined with aluminum tape to provide resistance to moisture or water. If the sheath is damaged, water may enter and spread in the cable. The WB cable has fibers wrapped with a water-absorbing tape rendering it moisture/waterresistant. The water-absorbing material swells in the event of water ingress to prevent the spread of water in the cable. In case SM fibers with the different mode field diameter were spliced, the splicing loss was extremely large. Is there a good solution to this problem? The OTDR method is in wide use for measuring the splice loss. When the splicing loss of SM fibers with the different mode field diameter is measured by OTDR, the measurement value is not the true splicing loss but the apparent splicing loss. The OTDR measures the level of radiation scattered back by the optical line and collected by the receiver of the instrument. Since the backscatter coefficient depends on the mode field diameter of the fiber, the splicing loss differs by the direction of the incident light. The error in a measurement made in one direction will be positive (Fig.1), and the error in the other direction will be negative (Fig.2). The use of an average of readings taken in opposite directions cancels the error due to differences in the backscatter coefficient of the two fibers (Fig.3). Even the same SM fibers (the nominal mode diameter: 9.2 um) have different mode field diameters within a design tolerance of +/-0.4 um. If the accurate splice loss is desired, it is necessary to conduct the measurement in two directions. Is there any good method to measure the connecting loss? Set up is shown in Fig.1. It is compliant to IEC 61300-3-4. 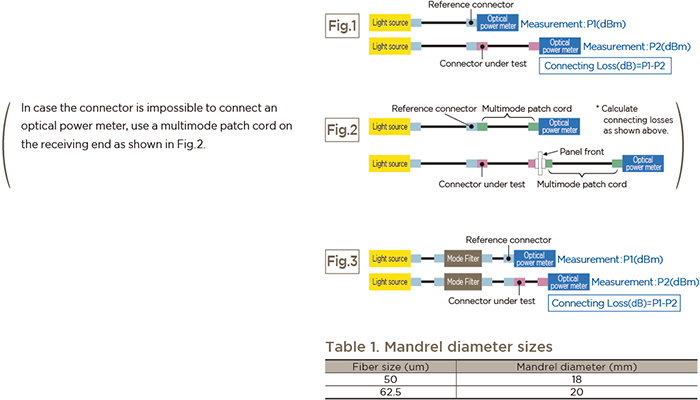 Figure 3 shows the set up for measuring the multimode connector. It is compliant to IEC 61300-3-4. The objective of a mode filter is to remove unwanted transient higher order modes and eliminate measurement inaccuracies. The mode filter consists of five, close-wound turns on a smooth round mandrel whose diameter is selected to ensure transient modes have been attenuated and steady-state conditions have been achieved. The diameter of the mandrel may differ from fiber to fiber depending on fiber and coating type. The typical mandrel diameters are shown in Table 1.